For 13 days explore Cambodia’s rich culture and history on a tour that takes you deep into the heart of the Khmer Kingdom. Discover the ancient Angkor temples and enjoy a rustic homestay; see the endangered freshwater dolphins that inhabit the Mekong and visit Cambodia’s bustling capital city. 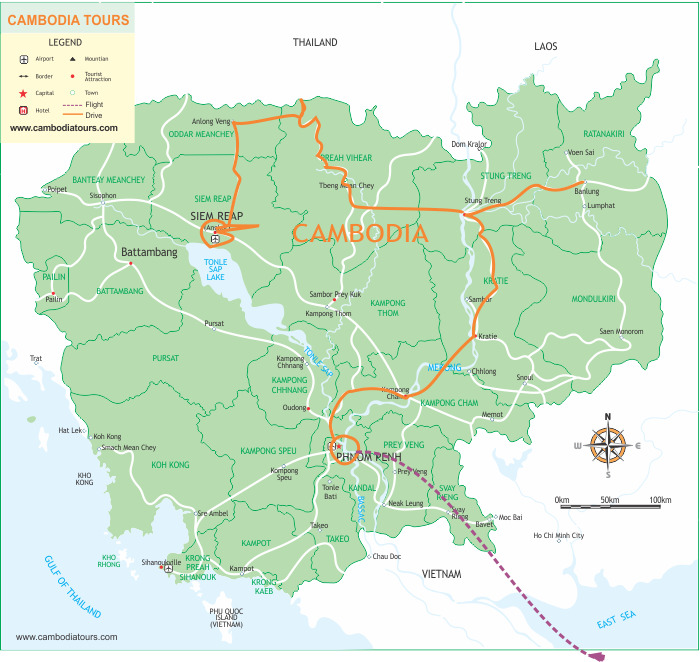 This vacation includes all of Cambodia’s highlights, offering something for everyone. Price from: $1078 - Book now! Welcome to Phnom Penh- the vibrant bustling capital of Cambodia. Despite recent rapid changes, the city exudes a sort of provincial charm and tranquillity with French colonial mansions and tree-lined boulevards amidst monumental Angkorian architecture. Upon your airport arrival, you will be met by your guide and transferred then to your hotel in the city center for checking in. The rest of the day will be free on your own. Begin your morning with breakfast at hotel then set out to see the capital city of Phnom Penh. Despite its recent turbulent history, it still maintains considerably charming. A city tour acquaints us with some major sights of Phnom Penh. The Tuol Sleng Prison Museum and the notorious ‘Killing Fields’ of Choeung Ek are not to be missed. A visit to these sights provides a deep insight into the painful bloody rule of the Khmer Rouge. In the afternoon, we will visit Royal Palace which is now home to the royal family. You also see the northern section of the Palace grounds where the most sacred Silver Pagoda lies and then the National Museum. Conclude your day by a browse around the fascinating Russian Market before making your way back to the hotel where you will spend the rest of time at leisure. Enjoy a tasty breakfast at hotel, check out to drive east to Mondulkiri which is the most sparsely populated although being the largest province in Cambodia. The province is chock full of natural beauty, with thickly forested mountains, powerful waterfalls and home where Khmer, Chinese, Muslim Cham and other tribal minorities live. On the way, stop at Kampong Cham, where you will visit the Wat Nokor Pagoda. This 11th century Mahayana Buddhist shrine is home to a large reclining Buddha as well as many carved Buddha images. Next, step on the longest bamboo bridge in the world before stopping at a local restaurant for lunch (your own account). Upon arrival in Mondulkiri, check in the hotel then enjoy the rest of the evening at your leisure. After breakfast at hotel, the driver will take you on 5 hour drive to Ratanakiri. The journey offers an excellent opportunity to observe rural Cambodia up–close. Located in Cambodia's far northeast, this rural rugged province of Ratanakiri is a 70% ethnic minority, which are known as "Chunchiet". Ratanakiri was as recently as 2002 seriously off the beaten track but has since been "discovered" step by step. Upon arrival, check in and enjoy your free time afterward. Departing from hotel around 8:30am. After a short drive (35km) you will arrive at Kachon village. From here you will take a traditional boat and head upstream to Kackork Village (20km) where you will stop to visit a traditional village and cemetery. You will then return to your local boat and cruise downstream along on the Sesan River and onwards to the town of Veun Sai (32km).Departing from hotel around 8:30am. After a short drive (35km) you will arrive at Kachon village. From here you will take a traditional boat and head upstream to Kackork Village (20km) where you will stop to visit a traditional village and cemetery. You will then return to your local boat and cruise downstream along on the Sesan River and onwards to the town of Veun Sai (32km).Back to have lunch at Bun Lung around 2pm. After breakfast, you enjoy a quick shopping tour in Banlung market before leaving to Kratie, a vibrant riverside town and home to the endangered freshwater Irrawaddy dolphins. Arrive in Kratie in the afternoon and check-in at your hotel. Then drive north of town and take a local boat to view the freshwater dolphins that inhabit this stretch of the Mekong. Enjoy an hour on the river, before returning to the quaint French colonial town for the evening. Note: Dolphin watching subjects to availability. After breakfast, your guide and driver will take you to visit Wat Phnom Sambok to see the Buddhist monasteries and to enjoy the magnificent views of the surrounding countryside from the hilltop. Continue to Sambor district (45 km from Kratie) to visit the “Hundred Pillar” pagoda of Wat Trasor Muoy Roy and visit also Wat Vihear Kork before arrive to Stung Treng. Stung Treng is located 50 km south of Laos, on the banks of the San River, just off the Mekong. It is a very quiet provincial city, showing the authentic and remote “face” of Cambodia. Visit the smallvillage of Thala Barivat on the other Mekong River side, crossing the river by speedboat. After breakfast, leave Stung Treng for 2.5 – 3 hours driving to Preah Vihear. The Temple of Preah Vihear, a unique architectural complex of a series of sanctuaries linked by a system of pavements and staircases on an 800 meter long axis, is an outstanding masterpiece of Khmer architecture, in terms of plan, decoration and relationship to the spectacular landscape environment. Situated on the edge of a plateau that dominates the plain of Cambodia, the Temple of Preah Vihear is dedicated to Shiva. The Temple is composed of a series of sanctuaries linked by a system of pavements and staircases over an 800 meter long axis and dates back to the first half of the 11th century AD. Nevertheless, its complex history can be traced to the 9th century, when the hermitage was founded. This site is particularly well preserved, mainly due to its remote location. The site is exceptional for the quality of its architecture, which is adapted to the natural environment and the religious function of the temple, as well as for the exceptional quality of its carved stone ornamentation. After breakfast, your guide and driver will pick you up for Koh Ker, a 10th century capital abandoned in the remote north of Cambodia for more than a thousand years. Enjoy a visit to the pyramid temple of Prasat Thom. Continue to explore the many temples at this incredible site, including the beautiful Prasat Krahom covered by jungle. Then, we continue for Beng Mealea, “Lotus Pond” Temple from the early 11th Century built by Suryavarman II asa Hindu Temple; about 2 hour drive from Siem Reap. If there is one temple to explore resplendent with jungle engulfing it, it is Beng Mealea. Clambering over large sandstone blocks to reach the inner sanctuary and eerie worship corridor is an exploration to remember. Situated 60 km east of Angkor Wat, through traditional countryside life, over bumpy laterite roads, Beng Mealea is a temple hidden in a maze of jungle. Architecturally, Beng Mealea is noted for its innovative, in its time, construction of hallways, it was a very large temple with wide galleries foreshadowing Angkor Wat. Garudas, hold up an outer platform, finer in detail than those to be found out in the elements of the Elephant Terrace at Angkor Thom. Surprises of fallen lintels with intricate carvings lay amongst the fallen wall and roofs. Arrive in Siem Reap late afternoon. Enjoy an entire day dedicated to discovering the mysterious Angkor temples. Wake before dawn and take a tuk-tuk ride to visit the magnificent Angkor Wat - the largest Khmer temple and finest example of Angkorian art and architecture. Return to the hotel for breakfast then set back out on a full day temple tour. Starting with Angkor Thom’s imposing South Gate, topped with the four serenely smiling faces of Avalokiteshvara. Next, visit Bayon temple, the Elephant Terrace, the Terrace of the Leper King and Ta Phrom Temple. After breakfast, going on boat trip on the Tonle Sap. This is the largest permanent fresh-water lake in South Asia and flows into Tonle River, joining the Mekong in Phnom Penh. We will see a “floating village” – boats that have been converted to look like houses and the “village” moves from place to place according to the water levels. We continue to one of the city’s lively open markets, Psar Chass, called the “Old Market”, where you can see the locals shopping and going about their lives. Your driver takes you to Siem Reap airport for your departure flight.